You can have the webpage myringover.com open automatically each time you open your browser Chrome or Firefox. This method is the same for Chrome and FireFox. - Open your web browser (Chrome or FireFox) and go to myringover.com. 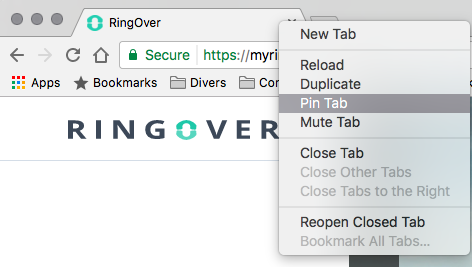 - The next time that you launch your browser, RingOver will automatically open under the dedicated tab.